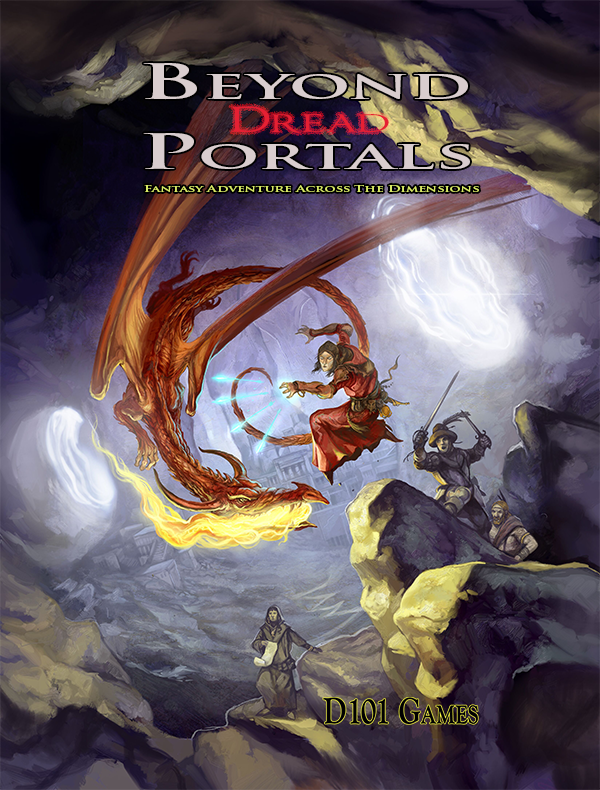 Beyond Dread Portals is a roleplaying game of worlds-spanning fantasy. The rules are built up from an Old School core based on loosely on the world’s first fantasy roleplaying game but heavily tailored to fit the setting. At the centre is the city of Ys, a corrupt and baroque fantasy city occupying a folded dimension of its own. Magical gateways created by the Guild of the Arcane link Ys to other worlds. On some these worlds, the city has set up permanent colonies. Ysian raiders, traders and explorers reach further afield. The heart of Ys is rotten. Its overlord, the Autarch, is literally a monster. His immediate underlings, his Agents, sow discord in the city and can hunt and feed on the city’s less prominent citizens with no fear of punishment. He leaves the apparatus of government and the rule of law to crumble and divides the power structures in the city among conflicted guilds, ensuring that no-one can depose him. Yet to the adventurous and unscrupulous, Ys presents opportunities as well as dangers. Perhaps a few heroes can even make a difference to the city and its empire as a whole. Welcome to Ys! By Paul Mitchener, co-Author of the Crucible of the Dragons, Age of Arthur and author of the Drowned Lands. Visit his Imaginarium. Hoping to Kickstart this one, once I’ve cleared the decks of some outstanding work, probably either by the end of this year or at the start of next year. I’ve got a full draft of the game, which initially started off as Paul’s homage to Planescape, but mutated into its own thing. It’s a large fantasy setting, where a magical city-state of Ys sits at the centre of an empire of other worlds connected by magic portals (hence the title). Its also a ruleset – which I’m tagging as post-D&D. It takes D&D as its starting point and then cuts and adds to it to make the ruleset match the setting. The nearest analogy is I can make if that second wave of AD&D 1st edition settings (Planescape, Dark Sun, Ravenloft etc.) had been self-contained games with modified D&D based rulesets. Bear in mind Paul also takes into consideration 30 years of games design on top of that, although he does so in a way that isn’t jarring to the starting point.